In 2016, the first group of baby boomers turned 70 years old. Millions more will do the same over the next 15 years, and as a result, selling activity in their retirement portfolios could be a big problem for markets. Boomers have always been a growth driver for our nation, but now they’re starting to retire en masse. Analysts believe that, for the first time in history, this will make boomers an economic hindrance. According to Pew Research, 1.5 million boomers turned 70 last year — old enough to draw full retirement with minimal penalty. Researchers expect that number to grow to 22.5 million over the next 15 years. Even under ideal circumstances, a populational shift of this magnitude can have serious implications for the economy. But, unfortunately, our circumstances are far from ideal. Let’s look at why this trend could be particularly harmful today. There are two primary reasons why retiring boomers could be problematic as they enter retirement in such large numbers. First of all, they’re heavily invested in equities. Yields in “safe” assets have been hard to come by for the past decade. So boomers turned to traditional equities to keep their retirement accounts growing. By some current estimates, boomers have about 70% of their retirement portfolios invested in equities. That means they’ll be putting serious pressure on equities’ prices as they draw down their retirement accounts. Worse yet, boomers will face a 5% minimum draw down required by the IRS. 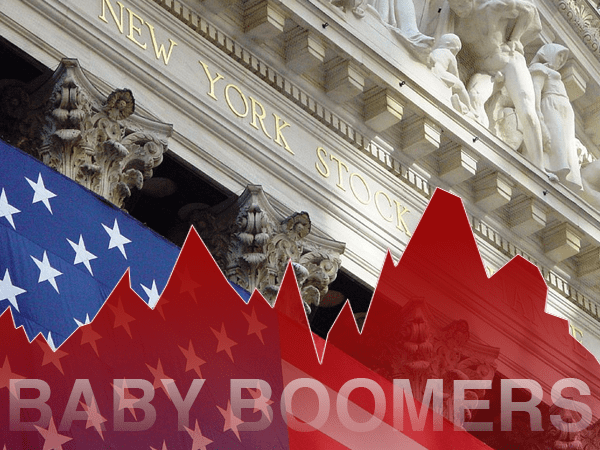 In addition to boomers selling off the equities in their portfolios under their own accord, the IRS will force them to withdraw at least 5% of their retirement account’s value (also known as a Required Minimum Distribution) every year after turning 70 ½. This could cause a downturn in equities to happen even faster. Boomer retirement rates are positioned to rattle markets in the years ahead. But there are two risk factors that could make the situation even worse. 1) We’re already due for a recession. Since the Great Depression, we’ve experienced some kind of major economic pullback every 4.2 years on average, according to data from the National Bureau of Economic Research. The longest recession-free period in our economy’s history was roughly 10 years, between 1991 and 2001. Remember, we’re swiftly approaching the 10-year anniversary of the crisis that set off our last major crisis in 2007. The cyclical nature of our economy is a proven fact. And today, we’re flirting with our best record ever. Further, experts believe the “Trump Bump” has run its course, and several warning signs across various parts of the economy are becoming apparent, such as slowed international growth, negative analyst surveys, contracting credit demand, tax receipts turning negative and apprehension from the Federal Reserve. 2) Boomers have far too little retirement savings. Boomer spending is an important support mechanism for the economy at large. If for some reason it starts to trail off, growth could be significantly hampered. It’s wishful thinking to believe returns will hold steady over the next decade. But even if they did, at say 7%, boomers with $136,000 in the bank would still be living off a paltry $9,000 per year. Considering all this, will retiring Boomers be the straw that breaks the camel’s back? Whether you’re a boomer or not, now is the time to start seeking protection from the danger that lies ahead. Traditional savings investments could become extremely dangerous in the near future, but there is a way you can stay protected. The time-tested security and reliability of gold makes it poised to shine when retiring boomers push the equities market to its tipping point. And amidst any turbulence that may follow, gold prices will likely move even higher. While you still have the time, right now is when you can ensure that your savings are allocated appropriately.